The Sanctuary has been operating as a charity since 1992. Gordon Jenkins Junior puts his newspaper clippings on the table. Some are weathered and yellow; some are crisp and whitish-grey. He’s been following articles about poverty for a long time. He’s one of 70,000 single people in Toronto (there are separate statistics for families) who are struggling to stay at or above the poverty line while living on social assistance. He spends his days reading and going from shelter to shelter for food. 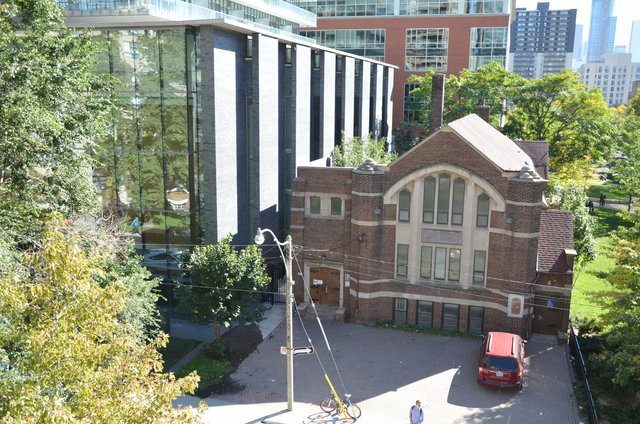 For years he’s been coming to the Sanctuary, a charitable organization headquartered in a former church at the corner of Charles Street East and Yonge Street. It’s located in a rapidly changing neighbourhood, where developers have planted their luxury condo seeds, each with advertisements projecting images of grandeur and exclusivity. But despite the area’s recent growth, it’s also an example of Toronto’s income inequality and the growing gap between the city’s wealthy and its poor. The Toronto Community Foundation’s most recent Vital Signs report revealed that Toronto is “the only Canadian metro to get a ‘C’ grade on income distribution.” In 2011, the city’s wealthiest made, on average, 13 times as much as members of the bottom 90 per cent of earners, according to the National Household Survey. The survey’s accuracy is disputed because of its voluntary nature, but its message shouldn’t be ignored. Toronto risks becoming a “winner-take-all” city by continuing to push such issues aside. A lofty condo building made of modern black brick and sleek glass overshadows the Sanctuary. 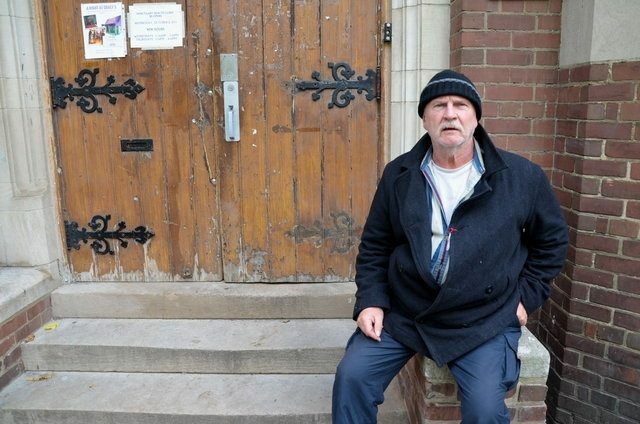 Greg Cook, who works at the Sanctuary as an outreach coordinator, says he’s had mostly positive interactions with people from the neighbourhood. He sees mixed-income areas as a solution, rather than as a problem. In the Sanctuary’s backyard, there’s a small park with picnic benches. Cook says he’s seen businessmen having lunch there beside homeless people. Gordon Jenkins entered the shelter system in 2001. Jenkins, 64, grew up in Montreal. He moved to Toronto for a factory job in 1980. He was working as a meat packer when a load of steel fell on his foot and broke it. He cringes when he recalls that terrible October day in 1994. The government gave him the opportunity to take a computer class. It took him 13 months to finish the seven-month course, and afterward jobs were sparse. In 2001, Jenkins lost his apartment. Then he entered the shelter system. Now, Jenkins lives in government housing. He’s still searching for a job, but he says he’s often told he’s too young or too old. “They keep throwing these barbed-wire barriers in front of me,” he says. With support from ODSP, he’ll make around $12,900 this year. He depends on places like the Sanctuary for free meals, clothes, shoes, and access to medical care. Although he appreciates what the Sanctuary does for him, Jenkins thinks it fuels his anger issues at times. He taps a newspaper clipping on the table. The headline reads: “Being poor exhausts brain power.” He nods. “You think I chose this?” he snapped back. At the Sanctuary, Jenkins can, at the very least, choose the people he interacts with. Cook says it’s a space where people from diverse backgrounds and income levels can meet. It’s one of the only places where Jenkins isn’t ostracized for being poor. And the neighbourhood around it is slowly learning to be more inclusive. Cook says the Sanctuary holds public art events to get the community involved. “We often see homeless people as people who have needs, but they have something to offer as well,” Cook says.